Veronika Brandt is Head of IoT Business Consulting at Bosch Software Innovations. She focuses on developing and implementing best practices for the strategic planning of IoT solutions, both within the Bosch Group and with external customers. Veronika Brandt holds an MBA from the LMU Munich and has several years of consulting experience at companies such as BearingPoint and Siemens. She joined Bosch in 2010 and has been supporting complex projects across various industries as a coach and solution architect. The digital transformation poses challenges for companies of many industries and requires methods to support organizations in their change process. The first step in this process is a company-wide assessment of the maturity levels of organizational capabilities. Based on such assessment, strategic actions can be derived to achieve defined target levels that help the company to progress on their way towards digital transformation. To support this process we have developed a comprehensive framework that combines four clusters of enablers for digital transformation (shown in the figure below). The “4E-Framework” gives companies a structured approach to analyze and build capabilities that position their business in a rapidly changing commercial environment. In practice, this framework enables companies to focus activities and resources on key strategic areas, and to measure the results. The 4E-Framework: How does it work? During an assessment phase, we conduct structured interviews and workshops to gather the information required to identify the company’s strengths and opportunities for improvement. This information determines a status quo in terms of maturity per cluster (environment, empowerment, execution, expertise). The clusters themselves are further broken down into 16 enablers. We elaborate several elements of each enabler, making each of them transparent and measurable. The information gathered during the interviews and workshops is used to assign a maturity level to each enabler (see figure below), ensuring a comprehensive description of the company’s situation. In this example, the company has already achieved the highest maturity level for “Trends”, while “Innovation culture” is at the lowest level of maturity. While a full review of all enablers and their elements would go beyond the scope of this article, we here briefly introduce the clusters. Environment: It is mission-critical to understand the business environment in which you operate. A clear view of your customer’s needs and current market trends is necessary to embark on the digital journey. The most successful organizations also demonstrate a degree of empathy, which allows them to understand, in greater depth, the ecosystems and various stakeholders they interact with. This presents a competitive advantage in their own positioning. 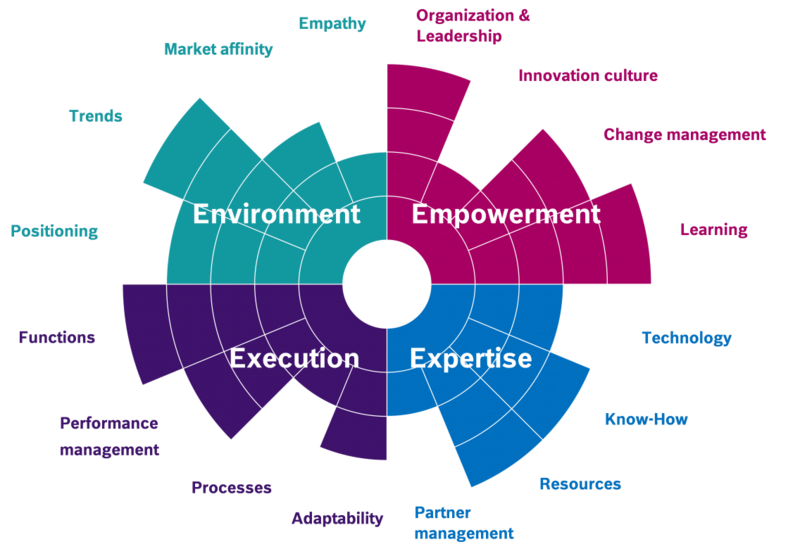 Empowerment: The empowerment cluster measures a company’s ability to lead with a clear vision, to innovate decisively, and to adapt to changes brought about through digital transformation. In particular, it captures how well an organization deals with digital leadership, how work is organized, and how employees are connected within teams and across business units. Expertise: This cluster deals with the setup of capabilities that are required to approach and implement new opportunities. Technology, resources and know-how that are relevant and required are investigated in detail. Since no organization will itself possess all the capabilities it needs, this is also the right place to think about how well strategic partner management is handled. Execution: When it comes to execution, we measure how well the company is positioned to manage and scale business functions and processes. Continuous improvement through performance management, and of the ability to adapt operations to deliver new products and services, are key indicators and drivers for sustaining business success. While companies cannot be expected to reach full maturity for all enablers, success in digital transformation does mean that all enablers are accounted for and can achieve basic level of maturity. To get an idea of how these clusters are addressed at Bosch, register for our 30-minute webcast, or contact us directly with your individual enquiries. The post How to approach digital transformation appeared first on Bosch ConnectedWorld Blog.